Efficiently getting a mid-July start to their “August Recess,” our very businesslike all-Republican Loudoun Board of Supervisors went out with a bang this week at their Tuesday night business meeting, tying up all kinds of loose ends as they hurried out of town. Actually, some of these hard-working public servants, notably Geary Higgins (R-Catoctin) and Chairman Scott York (R), haven’t been in town much lately anyway, judging by how many Board meetings they’ve missed. But when you have a 9–0 majority, showing up and voting just doesn’t seem that pressing a priority I suppose. The big news Tuesday was the Board’s approval of the meticulously developed new holiday display design for the courthouse lawn. 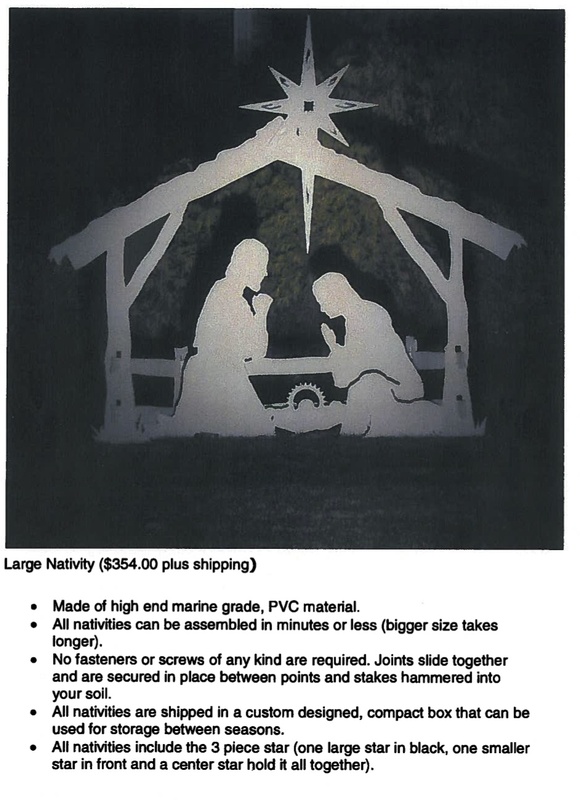 The Courthouse Grounds and Facilities Committee, charged with coming up with the design, helpfully provided the Board a sketch complete with exhaustively researched pictures torn from a religious wares mail-order catalog (example provided here directly from the official Board of Supervisors agenda packet from Tuesday night) showing the type of tasteful displays your government will be providing the taxpayers this year to make up for the tragic inability of citizens to celebrate the holidays on their own. For a second during the discussion Supervisor Janet Clarke (R-Blue Ridge) threatened to make sense, questioning why the county government was wasting so much time and effort on debating “lawn decorations” and even seemed to be heading towards the suspiciously sensible view that government ought not to be sticking its oar into religious matters at all. But then she clarified that she was merely suggesting that county government ought not be sticking its oar in and that official government religious holiday displays ought to be left to town governments to erect on their property, thereby presumably solving any constitutional questions involved. Deep Thinker “Ken” Reid (R-Leesburg) explained that by having the government henceforth dictate permissible religious content of displays on public property, he was fully respecting the “personal beliefs” of others who may have differing religious beliefs; he was just against “extremism,” which “Ken” defined as the expression of . . . differing religious beliefs. The Board’s sole lawyer, Shawn Williams (R-Broad Run), once again showed that sometimes it’s not a bad idea to have someone around who actually understands the principles our nation was founded upon. Williams — who with Clarke provided the two votes against the official government furnished high end marine grade PVC creche, Santa, reindeer, sleigh, and token menorah — noted that the county government was still “picking and choosing what religions we are representing with this display and this is inconsistent with the legal precedents” regarding the Establishment Clause. Of course the larger question has always been why should government be in the religion business at all. Here’s a truly radical idea: how about devoting the courthouse to the administration of the law without fear or favor, and leave it to churches, individuals, and other private property owners to erect on their own property whatever displays they choose to celebrate the holiday of their choice? That way we could even relieve elected officials like “Ken” Reid of the onerous duty of having to figure out for the rest of us what is good religious belief versus what is “extremist” religious belief. But then that would not permit the sort of feel-good grandstanding this Board excels at.